The report by the UN Food and Agriculture Organization says that eating insects could help boost nutrition and reduce pollution. It notes than over 2 billion people worldwide already supplement their diet with insects. However it admits that “consumer disgust” remains a large barrier in many Western countries. Wasps, beetles and other insects are currently “underutilised” as food for people and livestock, the report says. Insect farming is “one of the many ways to address food and feed security”. “Insects are everywhere and they reproduce quickly, and they have high growth and feed conversion rates and a low environmental footprint,” according to the report. The authors point out that insects are nutritious, with high protein, fat and mineral content. They are “particularly important as a food supplement for undernourished children”. Insects are also “extremely efficient” in converting feed into edible meat. Crickets, for example, need 12 times less feed than cattle to produce the same amount of protein, according to the report. Most insects are are likely to produce fewer environmentally harmful greenhouse gases than other livestock. The ammonia emissions associated with insect-rearing are far lower than those linked to conventional livestock such as pigs, says the report. 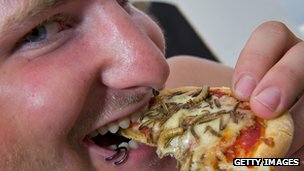 Insects are regularly eaten by many of the world’s population, but the thought may seem shocking to many Westerners. The report suggests that the food industry could help in “raising the status of insects” by including them in new recipes and adding them to restaurant menus. It goes on to note that in some places, certain insects are considered delicacies. For example some caterpillars in southern Africa are seen as luxuries and command high prices. Most edible insects are gathered in forests and serve niche markets, the report states. It calls for improved regulation and production for using insects as feed. “The use of insects on a large scale as a feed ingredient is technically feasible, and established companies in various parts of the world are already leading the way,” it adds.